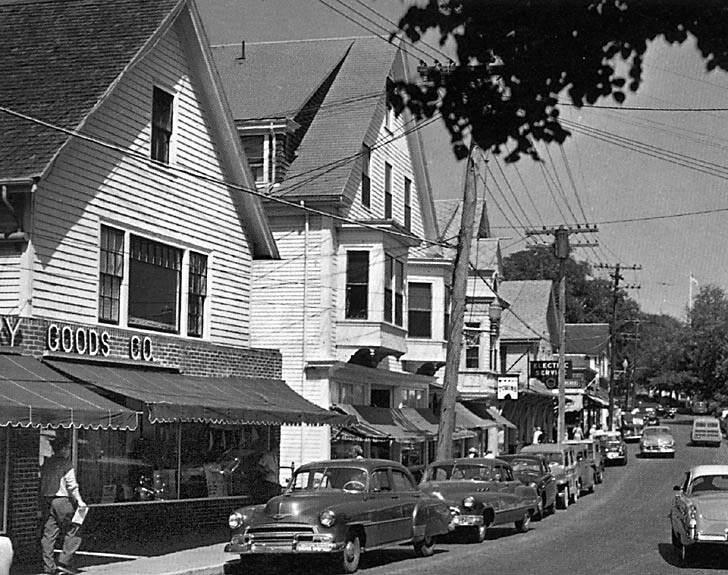 The following is a history of the buildings and businesses that have stood over the past two centuries in the location of what used to be Ernest Tilton's hardware store and Mrs. Aleta T. Tilton's dry goods store, and in recent years was the north end of the Vineyard Dry Goods store building, on the west side of Main Street in Vineyard Haven, Mass. Stan Lair said: "Next was Ernest Tilton's Hardware. Ernest always was just out of something when you went in to get something, and always said it was 'down on the wharf.' It'd be 'up on the next load of freight.' That is now part of Vineyard Dry Goods." RL: Then Ernest Tilton was right there, see. SL: You remember that one? John Holmes Jr. and Charles A. Luce wrote about the house that was here before the 1883 fire: "Mrs. Cynthia Chase House. Widow of Hiram Chase. Was ninety-six years time of fire. Not certain when built, probably early in nineteenth century by Dr. Benjamin Trask, who occupied previous to 1805. About 1810 occupied by Mr. Hanson, Baptist preacher, then by Jennie Godfrey. Jenny Godfrey was a character, very much afraid of the water. Never took but one trip off the Island, that to New Bedford before the times of steam or even decked packets, in open boat of Capt. William Harding. On return, dead calm, captain and mate had to pull every inch of the was, under a broiling sun, arriving home late at night. Jenny always alluded to this passage as a most enjoyable one, since which time long passages, in consequence of calms, have always been referred to as 'Jennie Godfrey times'. Mr. Chase came here from Sandwich and opened a hat factory. He was one of the early Methodists of the village. He was fond of telling this story. "At one time when he was about to sit down to dinner he heard a supernatural voice saying to him 'To the vestry, to the vestry,' and he dared not disobey. Proceeding to the vestry, he then commenced praying in a Boanerges-like voice. The people in the neighborhood, hearing the outcry, rushed with one accord to the vestry, and the result was the initiation of a great ritual. "Mr. Chase's rats caused Capt. William Cottle, whose store was across the street, to complain to Mr. Chase, but his complaints made no impression on the prevailing odor and he took the case into court, but was defeated." This property was the southern portion of a wide tract of land owned by Isaac Daggett until 1800, when it was sold to Leonard Merry, who in turn sold it to Dr. Benjamin Trask in 1802. See Site #31 for more on these early property owners.
" The deed also includes a right-of-way to "the Hatters Shop" and to "the Porch of the dwelling house." Chase bought an adjoining lot in the rear of his house lot for $1700 from widow Mrs. Mary C. (West) Carey in September 1840 which extended his property by about fifty-five feet in the back. Hiram Chase (1787-1866) was born in South Yarmouth, Mass., the son of David Chase and Salome Kelley. He was married in Falmouth(?) in 1808(?) to Cynthia Swift (1789?-1887) who was born in Waquoit (Falmouth), the daughter of Hiram and Cynthia Swift. Chase was a veteran of the War of 1812, came to Holmes Hole from Sandwich by 1816, and is listed in the Tisbury censuses of 1820 and 1840. He is listed as a Tisbury hatter in 1850 and 1865, as well as his 1866 death record. In 1833, the first Methodist Church in town was built nearby on Church Street (which later became the Masonic Hall and today is the Playhouse.) According to an article written by Mrs. Howes Norris and quoted in a June 1942 Gazette, "Over the doors and windows were placed fan-like blinds which so distressed Mrs. Cynthia Chase that she saw strange sights. She said, 'They were little hypocrites and saw little black devils dancing over there every night - and it was wicked and sinful to ornament God's house in such a manner.'" Eleanor Mayhew's book mentions hatter Hiram Chase at this site, and makes reference the "odor emanating from Chase's dye vats." Rev. Warren Luce, in his childhood memories published in a March 1923 Gazette, wrote: "My dear old friend was the hatter, Chase - opposite the Barrow Bros, store of those days. He had an eccentric and yet deeply pious son, who was paralyzed on his left side, incapacitating him for manual labor. So he spent much of his time in visiting the homes of the people, intent on doing some good. Many a time I've seen him stop, on some street corner, take a little New Testament from his pocket, and turning its pages consult them for instructions and guidance, as to whom to visit next." Hiram and Cynthia's son Alfred Chase (1809 - 1881) was born in Falmouth. He is listed as an "invalid" in the 1865 Tisbury census, and lived his entire life in the home of his parents. Their other children were Salome K. Chase (who married James M. Coombs and was living in Middleboro by 1866) and Harriet W. Chase (who married Parmenas Parsons and moved to New Bedford by 1866). Hiram Chase died in 1866, and the estate, valued at less than $1500, was inherited by his widow Cynthia. Following his death, or perhaps in his retirement, the Chase's evidently sold the front portion of the property, which apparently contained his hatter's shop (see below). They retained a narrow right-of-way from Main street to their home and property in the rear. In September 1878, Cynthia Chase deeded this lot and buildings to her daughters Salome K. Coombs and Harriet W. Parsons "provided, that in the event of my son, Alfred, coming to want, he shall the privilege of residing in said building while he remains in that condition." The elderly widow, perhaps illiterate or handicapped, signed this document with an 'X'. The 1880 Tisbury Census lists "Cynthy Chase," age 92, keeping house with her son Alfred Chase, age 70. Alfred died in January 1881 of "retention of urine." He was listed as an unemployed widower. In Apr 1882, Cynthia Chase again deeded her L-shaped lot ("the homestead of Hiram Chase") to her children Salome K Brown and Harriet W. Parsons for $400 "with a privilage of a way to pass and repass to the Shop and to the Porch of the Dwelling house standing on said premises." Chase's house was among the first to catch fire on the night of the great fire in August 1883. Her uninsured dwelling was valued at $800. The 95-year old widow was listed in the newspapers among those families "left nearly destitute." Cynthia Chase died in May 1887, at the age of about ninety-eight. Mrs. Caroline P. (Luce) Dexter (1816-1885) was born in Tisbury, the daughter of Presbury Luce and Peggy C. Dunham. She was the widow of Capt. George H. Dexter (c1813-1848) of Tisbury. Her daughter Eliza Dexter (1838-1890) married (1st) Rev. Stephen A. Thomas (1821-1873) of North Kingston, RI in 1856. Thomas was born in Rhode Island (records vary as to Hancock, Wickford, or North Kingston), the son of John D. and Anna Thomas. The report of the 1883 fire mentions the destruction of an uninsured house owned by Caroline Dexter valued at $800, "occupied by Mr. Hooper; small loss on furniture." Peter Hooper, like the widow Chase, was among those families listed as "left nearly destitute" in the papers. On August 30, 1883 the New Bedford Republican Standard reported that "Mrs. Caroline Dexter has bought the old homestead lot of Mrs. Cynthia Chase, for $200." A hatter's shop stood on this property from 1821, when it was mentioned in Trask's deed to Hiram Chase. It is not known whether Chase occupied this shop before 1821, or whether another hatter preceded Chase. The part of the property containing the shop was evidently deeded to Caroline Dexter around the time of Chase's death. Dexter's son-in-law, Rev. Thomas, had a clothing store, probably at this location, until his 1873 death. Thomas had been the pastor of the Baptist Church in Holmes Hole (see Site #23) from 1854 to 1859, after having served as pastor at Natick First Baptist Church in Warwick RI since 1851. Even after he stepped down as pastor, Rev. Thomas continued to be a practicing minister in Holmes Hole, performing most of the marriages that took place in that church until his death in 1873. Rev. Thomas was advertising his clothing store as early as November 1867 in the Gazette. In June 1869 his store was burglarized of goods amounting to about $300. What did Rev. Thomas' store sell? In Feb 1871, Rev. 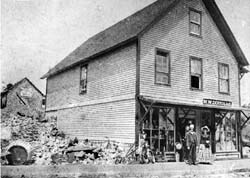 Thomas and Leavitt T. Norton (see Site #11) opened a store together in North Tisbury. 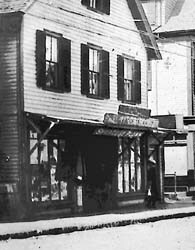 The Gazette reported, "Messrs. S. A. Thomas and Leavitt T. Norton, of Tisbury, have purchased the stock of Dow & Chase, at the old stand of Gorham & Hillman, Middletown, offer for sale a lot choice of groceries, provisions, and all articles usually found in a first-class country store. These gentlemen will continue their separate branches of trade in Holmes Hole." Thomas died in September 1873 at the age of 51. Thomas' business inventory included pants, overcoats, vests, jackets, muffs, hats, gloves, shirts, undershirts, shawls, gents wool hats, umbrellas, boys hats and caps, mittens and gloves, suspenders, collars, cuffs, spools of silk and cotton, needles, yarn, corsets, wallets, neckties, ladies collars, parasols, and many similar items. His widow Eliza married (2nd) William W. Douglas (c1846-1920) sometime before 1880. After the Thomas' death, Capt. Isaac C. Daggett (1816-1893) opened a store here. I have found almost no records of this store other than an August 1877 notice in the Gazette stating that Capt. Daggett was about to remove his stock of Gents' Furnishing Goods to the store lately occupied by G. C. Wheeler in Leach's Block (See Site #8?). Capt. Daggett was a retired master mariner, born in Tisbury, the son of Silas Daggett and Peggy Cleveland. He is listed on at least one whaling crew list, as a 25-year-old crewman on board Ship Joseph Maxwell of Fairhaven which left on a whaling voyage in 1840 and returned in 1843. He was married to Eliza N. Robinson, and lived for many years in the home of his father-in-law, Hervey Robinson. William Warner Douglas(s) (c1846 - 1920) was the second husband of Eliza Dexter, although the date and place of their marriage is not yet known. In September 1877 the Gazette reported that "The store lately occupied by Capt. I. C. Daggett for clothing and furnishings, is to be occupied by Mr. W. Douglas as a grocery." In October 1877 Douglas ran an ad stating that "The Boston Grocery Store just opened in Vineyard Haven. The Boston Grocery Store will duplicate any bill bought in New Bedford. All prices marked in large figures on goods, so all can see." They advertised sugar, molasses, pork, lard, beef, lamp chimneys, and teas. Douglas evidently had a restless nature, and his store did not last long. In May 1878 it was reported that "Stephen C. Luce has purchased the Boston Grocery of W. W. Douglas. The former proprietor is, we hear, going to Colorado, to enter in a new business." That October, Douglas and his wife left for Colorado, and he announced his plans intend to go into business there. For two years they lived and had a business in Canon City, Colorado, but they returned to the Vineyard in January 1880. In March 1880 the Gazette reported that Douglas had started on a cruise to Cuba with Capt. Silas Daggett in his "new fruiter," and in October 1880 that he returned to Canon City to pass the winter. The paper reported that "He will resume the charge of his business affairs, they having been conducted by an overseer while he was absent on his eastern tour." The 1880 Tisbury census lists the 34-year-old Douglas as "unemployed," living with his wife, mother-in-law, and stepdaughter. In November 1880 the paper reported "W. W. Douglas, having sold out his residence, and stock of goods at Canon City, Col., has moved to Silver Cliff, where he will engage in business." In May 1881, Fred M. West of Holmes Hole announced his intentions to "leave for Silver Cliff, Col. to enter employ of W. W. Douglas, Esq." (West returned soon after, if indeed he left at all.) In December 1881 the paper reported that Douglas had decided to "embark in business in New Bedford or Boston" and in the spring of 1882 that he was located on Main St, Charlestown, engaged in the furniture business. In July 1882, returned to the island to open a house furnishing business in Cottage City. That fall he moved his business back to Main Street Vineyard Haven - see Sites #32 and below. In May 1878 the paper reported that Stephen Carey Luce Sr. (1854-1941) had bought Douglas' grocery, and in June 1879 there is a reference to Luce's store. 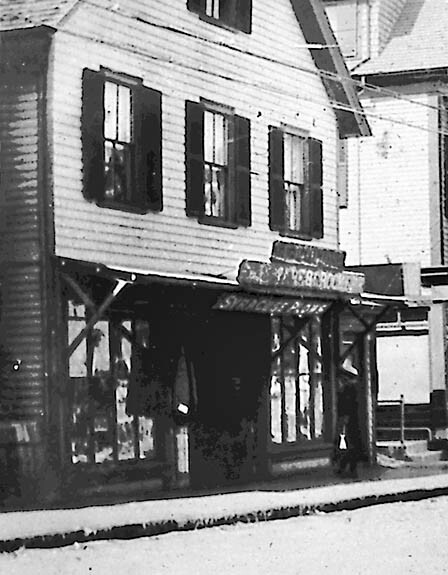 The 25-year-old Luce is listed in the 1880 Tisbury census as a "retail grocer" living with his wife and mother. Luce was a pioneer of the telephone on the island, operating one of Martha's Vineyard's first phones at this location - indeed, he is often credited for having the very first telephone here. In July 1881 the Gazette reported that "A telephone wire has been put up, connecting S. C. Luce's store with an office at Cottage City" and in September 1882 that "One can stand in the telephone office here and chat with his friend in Edgartown." Luce's grocery store burned to the ground about 10:30 the night of the great fire. The loss on his stock was valued at $1500, and Mrs. Dexter's store at $800. Luce's good were insured, but the building was not. Within a couple weeks of the fire, the papers reported that Luce's store had temporarily been relocated to "his store on Wharf street." See Site #32 for Luce's new store. Shortly after the fire Cyntha Chase and her daughters Salome K. Brown of Tisbury and Harriet W. Parsons of New Bedford sold their portion of this burned property for $200 to Eliza D. Douglass "with the brick and stone thereon." The deed included the right-of-way from Main street "to the place where the hatters shop of the late Hiram Chase once stood, and also to where the porch of the house of said grantors stood." Stan Lair wrote on the back of this photo: "This picture was taken 3 days after the Vineyard Haven fire. The figures are Wendell Crocker and Amourilla Marston Clough - later Mrs. H. R. Flanders. The Douglas store was later bought by Mr. Crocker, he still later sold it to a Mr. Cottle, who in time sold it to Ernest Tilton. It is now structurally a part of the present Vineyard Dry Goods Store." After Douglas' store (site #32) burned down in the great fire, the Cottage City Star reported that he was erecting a temporary quarters for his hardware business "on a part of the lot lately occupied by the residence of J. H. Lambert." The New Bedford Evening Standard and the New Bedford Republican Standard both reported that "W.W. Douglass is putting up a wooden building, which he will occupy as a hardware store." The next week, the paper reported that Douglas had purchased the lot on Main street on which the "old Chase mansion" stood and was erecting a building for his hardware business. It went on to say that his mother-in-law Mrs. Dexter intended to later erect "a more pretentious building" on the lot where Luce's grocery stood, which be occupied by Douglas when it was completed. 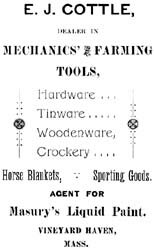 The Aug 31, 1883 paper listed Douglas with his "new stock of hardware, crockery, etc. at his temporary quarters on site of old Chase mansion, Main Street." In mid-September, 1883, the paper reported that excavations had been made for erecting a 24' by 40' store on Mrs. Dexter's lot. The building was to be used for Douglas' hardware business, and the upper story as a tenement (and the following spring Horace Tilton was living in the apartment above the store.) In October Douglas' new store was said to be "progressing " and the paper described it's location at the head of Wharf street as a "good location for his business." 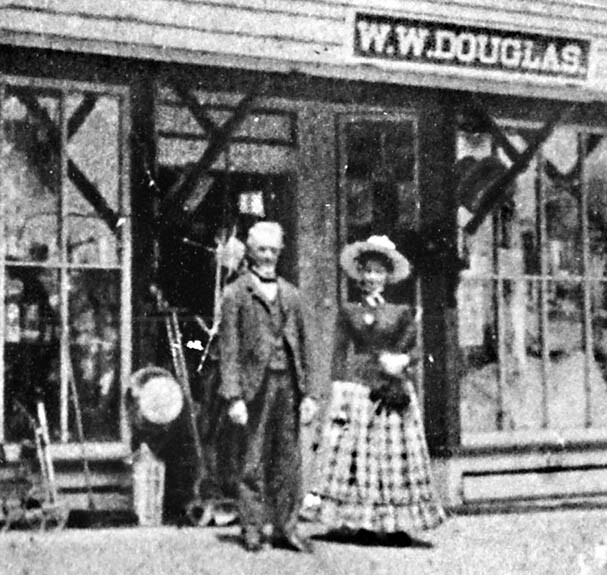 In November 1883 Douglas moved into his new store. In November 1883 it was reported that E. H. Manter's boot and shoe store was now located at Douglas's store. In January 1884, the paper reported that since the fire, "E. H. Manter's Boot and Shoe Store and Printing Office" had been located at Douglas' Hardware Store. 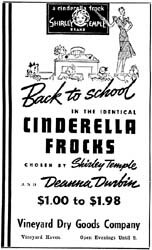 He advertised men's and women's shoes and boots. By October 1884, Manter had moved to Lane's Block. In October 1884 Miss M. L. Norton opened her millinery rooms over Douglas' store, and announced that she was opening a branch store in North Tisbury. In the fall of 1884 Douglas built a small addition to the rear of his store. In the spring of 1885, the paper made references to a (public?) pump owned by Douglas near the store. In December 1884 he bought out the hardware business of J. F. Robinson and added Robinson's stock to his own. The 1885 town report noted that he had sold nails to the town in the preceding year. In 1886 Douglas sold shovels, hoes, and axes to the town, and "sundries" to the school. In 1890, Douglas sold crayons to the school. In 1885 Douglas' mother-in-law Caroline P. Dexter died, and this property, valued at $1600, was inherited by her daughter, Mrs. Eliza (Dexter) Douglas. "Our quiet village was startled on Thanksgiving night by the report of the shooting of Bryan Ryan by W. W. Douglas. Ryan is employed at the harness factory and has had trouble with Mr. Douglas about a bill. About four o'clock Ryan under the influence of liquor threatened Douglas' life and left saying he would 'fix him.' After dark he knocked at Douglas' front door. Mr. D. went out the side door and Ryan approached him with an uplifted cane, demanded apology and struck at him. Douglas in retreating tripped and fell and being at the mercy of his antagonist drew his revolver and fired, striking Ryan on the hip and second shot went through the overcoat. Ryan was carried to Dr. Lane's office where the ball was extracted. Ryan went to New Bedford and returned last Saturday. Mr. Douglas swore out a warrant for his arrest, and constable Luce took him to Edgartown jail." "Bryan Ryan testified: Went to Douglass' store about half past four; I asked him if he received the money; he replied, 'It makes no difference to you if I had or not, you are a low-lived _____'; he said I beat my wife; I told him he lied and said 'Mr. Douglas, you will have to take back those words some day'; I went to his store in the evening, found it closed and went to his house to get explanation about his saying I beat my wife; he said, 'God d__n you, I'll shoot you,' and with that he shot me; as he rushed toward me I dropped my stick; picked it up and fled; he followed me and fired again; I met Mr. Lambert and told him Mr. Douglas was after shooting me; I never used threats; went to his store to make friends; he abused me for twelve months; always carry cane; have short leg; I did not say to Mr. Crocker, 'I'll murder him'; had no talk with Douglass since; arrested Saturday but was carried home and left till Monday and brought to jail; was with lawyer Morse Sunday; Dr. Lane took bullet out and dressed wound. Cross examined - Can't write; never been in jail before; made no threats; he never told me to go out; never said 'I'll fix him'; never said 'I'll murder him,' nor 'tear his tongue out'; did not strike at him. After testimony from a number of witnesses (almost all of whom spoke of Ryan's bad reputation) Ryan was sentenced to six months probation, and the case against Douglas was dismissed. In September 1889 Douglas' store was robbed. Mrs. Eliza Dexter Douglass (1838-1890) died in November 1890. Eliza had written a will in 1888 that left to her husband "the Lot of Land on which his store now stands known as the 'Chace Lot.'" Eliza was relatively wealthy by this time, and her estate included personal property of more than $26,000 (mostly stocks and bonds) in addition to the store, their home on Franklin Street, several woodlots, and two lots in Canon City Colorado. 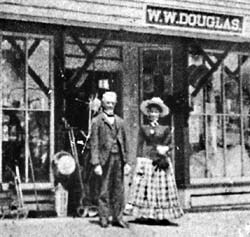 Immediately following the death of his wife, in early December 1890, Douglas sold his hardware business to Edward Cottle of Lambert's Cove, and moved to the California coast. He returned briefly the following spring (perhaps in part to complete the sale of the property), but then returned to the west coast. By March 1892 he was living in Los Angeles. 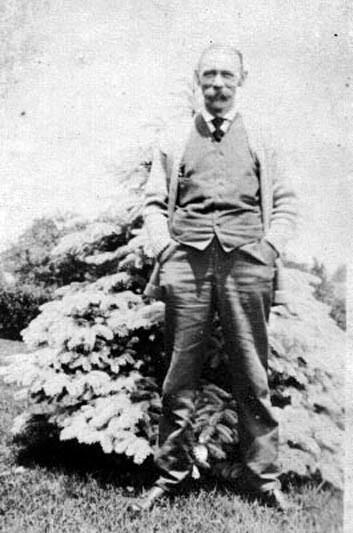 William W. Douglas died in Southern California in April 1920 at the age of 73. Gratia Harrington, in a 1967 article for the Gazette, wrote: "[This store] was Mr. Crocker's emporium, part hardware and kitchen furnishings. It also had a penny candy counter, over which one hung in breathless indecision. When at last a decision had been reached and one stretched out one's hand for the prize, one found it withheld, and Mr. Crocker demanding, 'Show us your money.'" In February 1891 William W. Douglas sold this property to Edward J. Cottle including the store and its outbuildings for $2000. 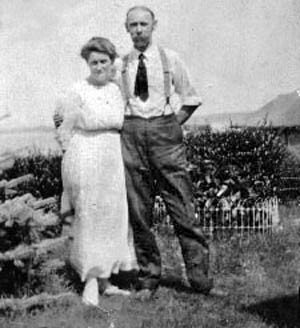 Edward Jones Cottle (1869-1897) was born in North Tisbury, the son of Edward and Martha (Tilton) Cottle of Tisbury and Chilmark. In December 1891 Cottle married Mabel Cleveland, and they moved into the apartment over the store. In October 1892 the paper reported that Wendell Crocker had retired from business and that Cottle was planning to occupy the entire store for his hardware business. Crocker died in December 1894 at the age of 76. 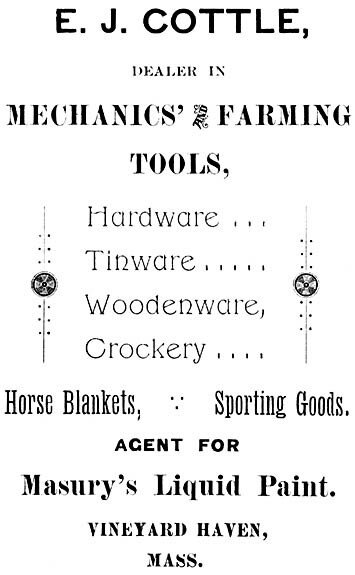 In 1894 and 1896, town records show that Cottle sold hardware, tools, nails, and sundries to the town. In October 1897 Edward J. Cottle died at the aged of 28 of "Acute Myetitis" (Possibly myelitis, and inflammation of the spinal column or bone marrow?) His obituary states that he came to Vineyard Haven as a young man, bought the hardware store and property for sale by W. W. Douglass, and although he "began work with no experience" his store was successful. It also states that Cottle was a member of the fire department. At his death, the property, building, and outbuildings on this site were valued at $3600, and the stock in the store at $3629. In December 1897, Emma M. Cottle, and Beatrice C. Cottle (who was Edward Cottle's daughter) sold this lot and another adjoined rear lot to north to Owen H. Tilton for $2400. Lumber dealer Owen H. Tilton (c1836-1901) was born in Chilmark, the son of Benjamin Tilton and Susan Hillman of Chilmark. In December 1897 the paper reported that Owen Tilton's son Ernest R. Tilton had "bought out the store formerly owned by his cousin Mr. Edward S. Cottle, deceased, and will take charge in the near future." Later that month they reported that Ernest Tilton had "taken charge of his china and hardware store on Main Street" and that Miss Ida Luce was to remain as clerk at the store. The store opened on Dec. 5, 1897. 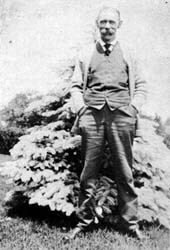 Ernest R. Tilton (1874-1933) was the son of Owen H. Tilton and Eliza R. Cottle of Lambert's Cove. 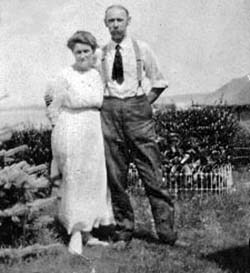 He married Catherine Fraser in 1899. 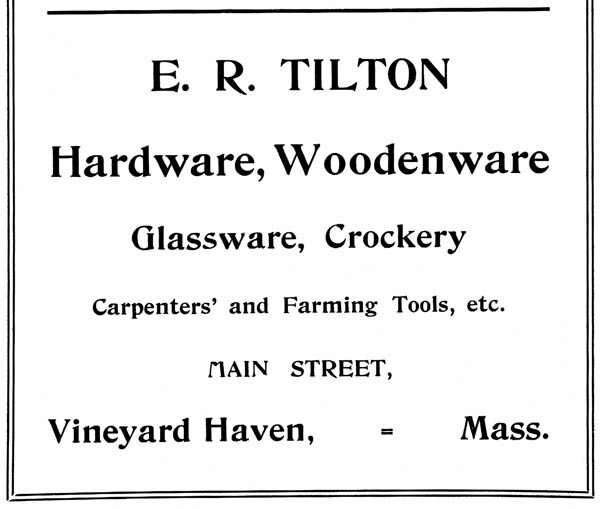 The 1900 census lists Tilton as a "hardware merchant." In October 1900 Tilton added a covered stairway to his hardware store. In 1900 he sold hardware to the school, and brooms, tools, nails, chimneys, reflectors, padlocks and shovels to the town. In 1903 he sold lamps and brooms to the town. In August 1904 the town gave Tilton a one-year license sell gun shells and rifle cartridges in his store. In 1905, town records show that Tilton sold shovels and brooms for roadwork, as well as burners, chimneys and wicks for lighting, and nails, shovels, pails; in 1907 he billed the town for brooms, chimneys, and wicks; and in 1909 he sold hardware, brooms, burners and chimneys to the town. In June 1912 he advertised "roofing." 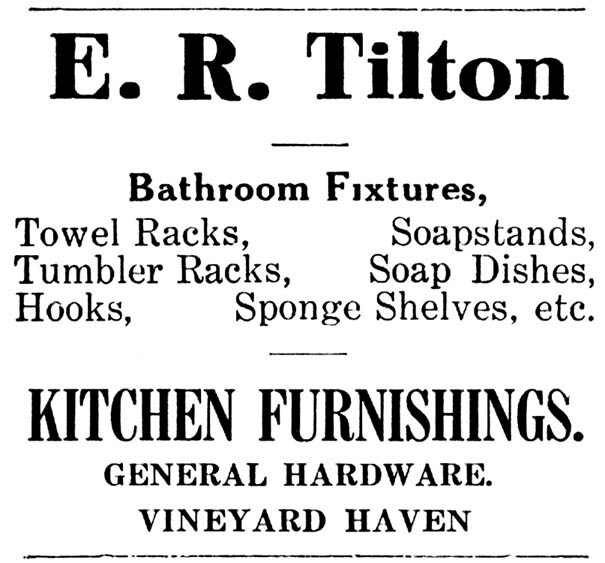 The 1907 and 1910 directories lists Tilton under "hardware, woodenware, etc." and shows that Ida M. Luce was still working as a clerk at the store in 1907. 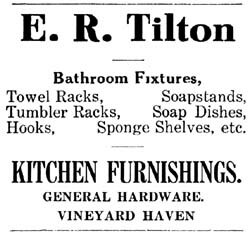 The 1910 Tisbury census lists the 35-year-old Tilton as a retail hardware merchant. Ad from the 1907 directory. In the 1910 directory he ran the same ad with the addition of "Paints and Oils"
Ernest Tilton's hardware store is on the left. Photo taken 1920s? In October 1912 Ernest Tilton bought part of his brother Herbert Tilton's stock. Herbert was getting out of the plumbing business and turning his store into a drug store and soda fountain (see Site #25). 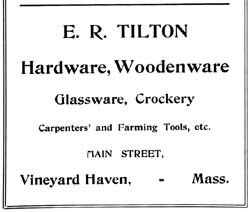 In July 1913 Tilton was selling Eldridge maps in his hardware store, and the 1914 map of town lists his store as "Hardware and Crockery." 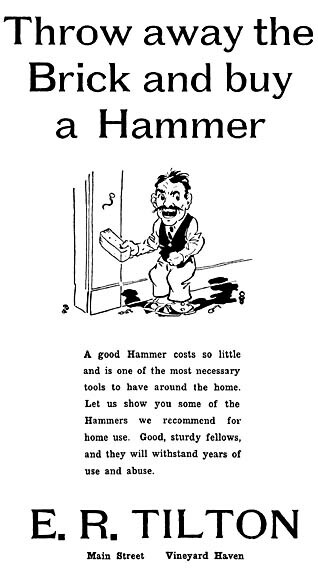 He advertised varnishes in April 1921; "hardware and kitchen furnishings" in July 1925; "general hardware" in October 1925; and paints and hardware in 1927. Connie Leonard said: "The one thing I remember: An elderly lady, I think she was the lady who worked there, sitting in the front window right at the street and rocking and knitting. I don't think it was a very good business, as I remember. 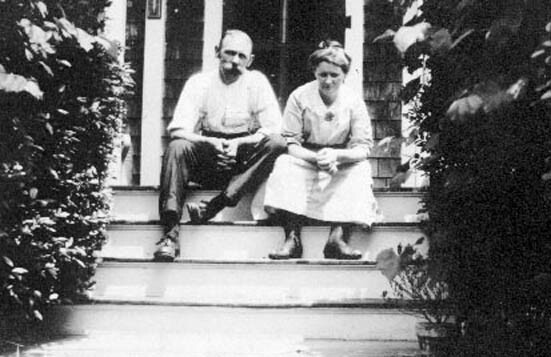 Ernest R. and Kate Tilton. Photos courtesy Donna Tilton Doel Griffiths. 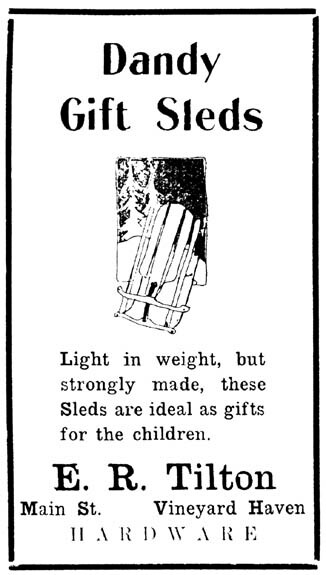 Dec 1925 ad. 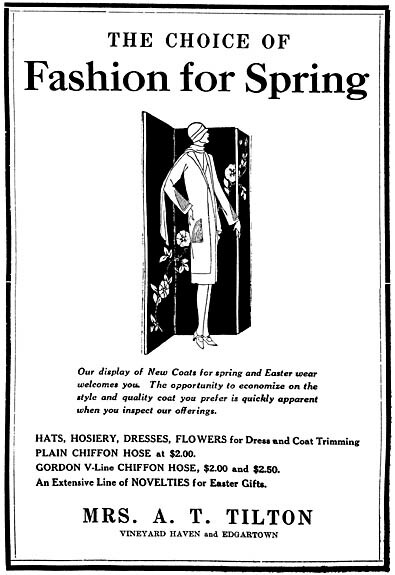 Jan 1926 ad. 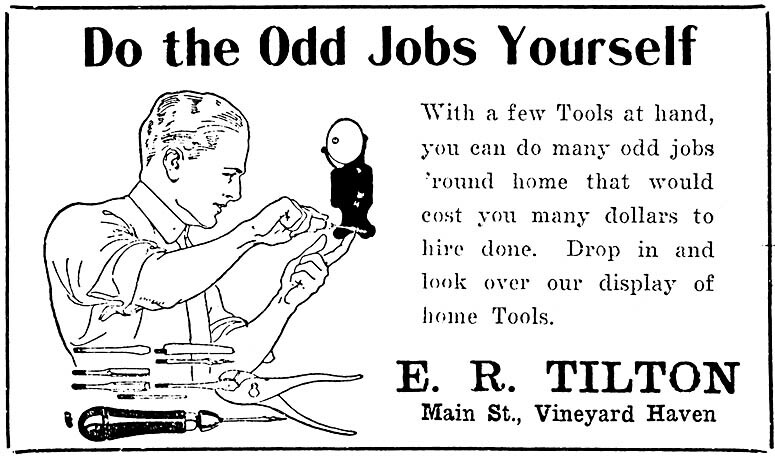 December 1925 marked the 28th anniversary of Tilton's hardware store. The paper noted that "There has been a hardware store in that building since the town was rebuilt after the great fire, and in fact it is said that the building was the first to be erected when the reconstruction began. Ernest has been there for 28 years since he purchased the business from Edward J. Cottle, and his is the only business on Main street which has neither changed its location or management in that time." Ernest Tilton retired and closed his business by the beginning of 1928, when his sister-in-law moved her dry goods business into the store building. He died of pneumonia in June 1933 at the age of 57. His obituary notes that he had "at one time the largest hardware business on island." In February 1928 the Gazette announced the "formal opening" of the new store of Mrs. A. T. Tilton on Main Street in what had formerly been the E. R. Tilton Store. Mrs. Aleta T. (Robinson) Tilton (1870 - 1933) had operated a successful dry goods business next door since 1912. (See Site #30.) She also maintained a branch store in Edgartown at this time. A 1976 Gazette article remarked: "Older Vineyarders remember the old time dry goods store of Mrs. H. L. Tilton who had followed Josiah Bodfish, a typical establishment of the early years of the century." In June 1928 Mrs. Tilton advertised the "Readmore Lending Library" which offered books at the rate of two cents per day. 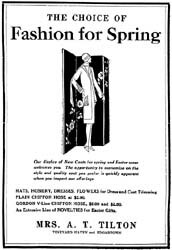 In July 1928 she advertised curtains, in June 1929 sport coats, rain coats, short coat ensembles, and "Mrs. Tilton's Circulating Library"; and in August 1929 lace curtains, Mayflower spreads, and novelties. In May 1929 the Gazette reported that the front of Mrs. A. T. Tilton's store was being redecorated. That summer her store was open until 10 p.m. each night. In December 1929 the Gazette reported that "The store building of Ernest Tilton on Main Street was purchased by Paul Bangs on Monday. The store is occupied at the present time by Mrs. A. T. Tilton. Mr. Bangs has announced no plans as yet." In December 1930 the paper reported that Ernest R. Tilton had sold land on Main Street to Paul B. Bangs. 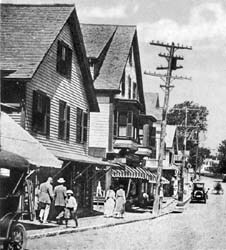 In May 1930 the Gazette noted that Mrs. Albert Pitard had taken a position as a clerk at Mrs. A. T. Tilton's dry goods store, and the same month that Beatrice Tucker from Newtonville had also taken a clerk position. In October 1930 the paper reported that Mrs. Albert Picard was still working as a clerk at the store. In November 1930 the paper reported that Mrs. George Sears was clerking at Mrs. A. T. Tilton's dry goods store during the absence of Mrs. Campbell. Dorothy Brickman said: "Mrs. Tilton, her husband had the drug store. You know, they had the pharmacy there, and gifts and so forth that the drug stores used to have. And his wife had a little tiny store which was - how can I tell you? - long, but very narrow. She sold materials and things to sew with. And that was there for years. Mrs. Tilton was like Mrs. Vincent, Mrs. Vincent of the paper store. She was that kind of a lady. She was - how shall I say? - a very prim, proper lady, and dressed as the generation dressed then. She was a lady boss in her store there. I'll tell you used to work for her years ago, was May Baptiste, Chicken Baptiste's wife. She was a wonderful knitter, I remember. So I do remember Mrs. Tilton. She was a very proper business lady. It was a small, narrow store. Mainly materials is what they sold." Mrs. A. T. Tilton retired at the end of 1930, and sold the business to Judal Brickman. She had been 39 years as the proprietor of a dry goods business on Main Street. She died in December 1933 at the age of 63 of gall bladder cancer. Ida Bernice Brickman (1908-1999) was born in Malmo, Sweden, the daughter of Russian emigrants Judal and Eudice Brickman. She came with her family to Vineyard Haven in 1913. She married David Levine in Dorchester in October 1930. David Levine (c1905-6 - 1976) was the son of Max Levine of New York. According to his obituary, "He was a graduate of Springfield Commercial High School and had been employed with a printing firm in Boston before moving to the island in 1930. He had considered entering the printing business, following the late Ellis Manter who had carried on as a printer in Vineyard Haven for many years, but his final choice proved a happy one." "I remember just like it's today. The way my conducted our family was the old European way. My father was the patriarch of the family and all the children were right under that patriarch, and everybody became part of the business. So when my sister Ida married, my father bought that little store and gave my sister the keys and said 'Go make a million now.' They bought Frank Swift's many years later, and merged it into one big building. 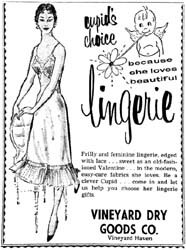 And so that's the history of the Vineyard Dry Goods." "Relatives. All I know about that, [Levine] wanted to move off-island, and it seems to me my father persuaded him not to. And then they went into this business. They bought out somebody who was already established, and they started new lines, and other dry goods things, and they did alright." They opened the store on Jan. 15, 1931. The store measured 20 by 30 feet. A 1991 Gazette article noted "Ida Levine opened her shop in tough times, in the middle of the winter and the middle of the Great Depression. She stocked her small shop with colorful bolts of cloth and spools of thread, dry goods and notions." 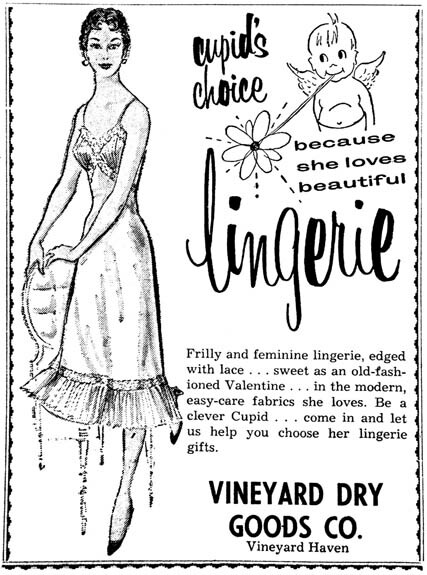 The Vineyard Dry Goods advertised dresses in June 1931. 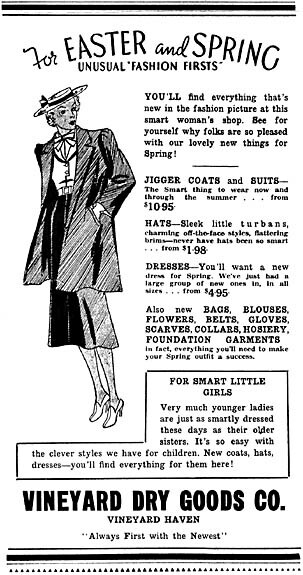 In February 1933, they advertised "The Style Shop" featuring women's clothes, and in August 1933, "The Sports Shop." The Gazette reported "extensive remodeling" at the Vineyard Dry Goods Co. store in March 1937, and in February 1939 they remodeled again. A 1976 Gazette article recalled: "Nine years after he began business here, Mr. Levine planned an expansion to almost double the store's former capacity, making it, as he said, 'a more pleasant place to shop.' The remodeled store was opened in March, 1939, with a new front replacing the Victorian aspect, show windows and showrooms emphasizing size, light, and easy visibility." "The Vineyard Dry Goods Company reopens Thursday after weeks of remodeling and decorating which have produced what the management proudly declares to be the finest women's store this side of Boston. "The outward appearance in itself is impressive. The building, which is of the extremely plain Victorian style, has been changed slightly in order to add light and display space. The upper story is distinctive for the mullioned window, which is extremely in keeping with the style of the building, and adds greatly to the lighting and appearance both inside and out. "The display windows on the street floor are spacious and compare favorably with those to be found in the larger city stores. In style, finish and with the added attraction of an all-glass modern front, the skill of the contractor in blending modern appointments with the architecture of fifty years ago is apparent. "On the lower floor of the store, which has been increased in size, will be stocked the dry goods, notions, and accessories of the specialized women's store. New fittings of birch and maple, finished in light satiny coloring, add to the attractiveness of the place. Only a few showcases are used, and these are of a style which match the short, modernistic counters. The shelving and mouldings are also finished in the same woods. The floor is of hardwood, and the indirect lighting system serves to illuminate the entire store without glare or other hindrance in selecting colors and inspecting goods. "At the right of the entrance is the sweeping stairway leading to the second floor, which is devoted entirely to the ready-to-wear articles for women's and children's wear. At the lower bend in the stairway is a glass covered niche in which will appear a single dress model, the outstanding one in popularity at the moment as chosen by prevailing fashion. "The upper floor, lined with recessed display cases, is floored with heavy linoleum and by reason of its arrangement is so separated from the floor below that the quiet and privacy of the department are complete. The same floodlighting effect is employed as on the floor below, and the same counters and trimmings. "At the rear of this floor is the store office, a fitting room, and a combined powder room and lounge, equipped with all conveniences for the woman shopper. Altogether the remodeled store presents a pleasing and attractive appearance and adds much to the shopping district of Vineyard Haven." "That was my sister and brother-in-law Dave. Well, I know that I used to work there. In our family we all went to work when we were very young. I used to help out there because the store used to have, carried all of the material business and then had what they called 'notions and findings.' And then my brother-in-law, he loved to read, and he put in the lending library in the store. And then eventually they expanded and of course it grew into a department store eventually. But in the early days it was a small store. The way our family had its business, we all were all trained and equipped to do everything. All kinds of things. Of course my sister and her husband were the real managers. I used to come down because I can remember doing things in the store. And so we were very much a part of it. "When I worked there, well I waited on customers, I used to order some of the merchandise, especially the findings, the notions. Well [findings and notions] were really the same thing. They'd be sewing materials, and pins, and needles, and tape measures, and all things like that - we'd call that 'findings,' notions and findings. "Incidentally, also I want to say who worked for Ida, was May Baptiste. Did I tell you she also worked for Mrs. Tilton? They were clerks in the store - she and Sarah Viera and Florence Borges, I remember. And then later toward the end we had June DaSilva, her sister Hazel Faria, sisters from Scotland. The staff that they had in the dry goods store, I will say one thing about the management in both business - hardly any turnover in help. It was like a family. I know that the philosophy of living that we had in our family extended to the business. Deep consideration and kindness to all the people of the staff. And very happy. And so there wasn't, you know, quick turnover." Florence (Frank) Borges worked at the Vineyard Dry Goods for about three years, from about 1939 until 1942, and occasionally afterwards. (She later worked for Elsie Hudson - see Site #13?) She recalls working with Alice Issokson, another woman named "Ida" who worked there with her sister, Dorothy Brickman who "filled in on occasion," and of course Dave and Ida Levine. Florence (Frank) Borges said: "I was a clerk. Selling clothing, and yard goods, and ribbons, and all that sort of thing. It was interesting in that, I of course being of Portuguese descent, there were great many of the older people who didn't understand English then. It was good that I was able to help out. They would tell me something and when it puzzled me as to what it was that they were asking for, well then I would ask my mother and then she would tell me what the correct definition of it was. It was really quite interesting." you know 'behind every man there's a good woman'? And I think they had a real partnership to them. "I was there at one transition, when they remodelled quite a bit. That was very interesting - we had big bins all around the store." The paper noted that Mrs. George Baptiste was working at this store in October 1942. Mrs. Dorothy Paltz (wife of Raymond Paltz) is remembered to have worked here after leaving Vincent's paper store (Site #27.) Mrs. Josephine Correllus was working here by 1948. Sarah Viera was hired by Ida and worked here during the 1940's, for about ten years, then left and returned later. She recalls Hazel White, Maxine Bardwell, Mabel Silva, Dorothy West, Ida Silva, May Baptiste and Shauna Lima working here, as well as Martha Dunham in recent years. Agnes Rice said: "My mother bought all my clothes in there at the time. We bought a lot of clothes in there. It was a great store. [Ida] did a great job, she had nice things. I remember Ida. And she had a cousin, I think she worked there. I remember her husband Dave. They ran it together." 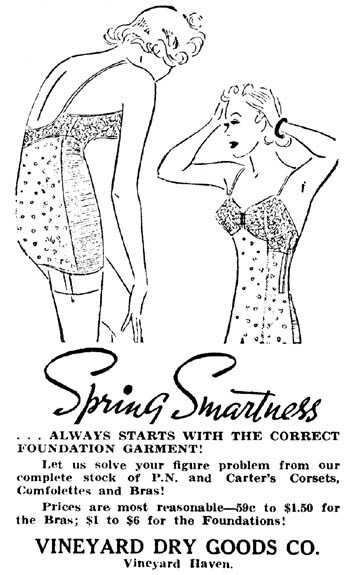 In April 1940 the Vineyard Dry Goods advertised "Women's Clothing and Accessories," and in July 1943 they called themselves "Martha's Vineyard's modern department store, specializing in Smart Sportswear and Beachwear for Women and Children." Their dry goods department upstairs featured "linens and domestics." The store was open each evening until 9 p.m. that summer. In August 1944 Brickman's Inc. and Vineyard Dry Goods Company Inc. were both incorporated. The two corporations were run by Judal Brickman, Eudice Brickman, Abraham Brickman, Sadye Brickman, Dorothy Brickman, Jack Levett, Rose Levett, David Levine, and Ida Levine. "The predicament of Dave Levine, Main street business executive, is without parallel in the history of this ancient thoroughfare. Dave recently had an inter-com connection installed on his store phone. By such means he can talk to his clerks, bookkeeper, and so on, as well as the outer world. There are four buttons on this instrument, for switching to Mrs. Correllus, Mrs. Levine, and so on, and the apparatus constitutes a mystery that has aged Dave several years in the course of as many days. For, believe it or not, he is liable to get a response from the long distance operator in Falmouth when all he wants is the price of the pink bras upstairs, and when he inquires as to the account of a client who wants to pay a bill, it is quite likely that the New York Stock Exchange reels off a couple of figures! Something has to be done about this!" 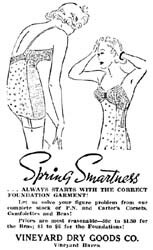 In March 1949 Frank Swift retired and closed his men's clothing business next door (see Site #28.) The following month the Swifts sold their property to Alfred Hall of Edgartown, and in May 1949 Hall sold the property to Eudice Brickman. A 1976 Gazette article recalls: "In 1949 Mr. and Mrs. Levine took over the Franklin H. Swift store next door, location of the former Howes Clothing Co., and incorporated it into the present impressive, spacious quarters of Vineyard Dry Goods in its important place on Main street." 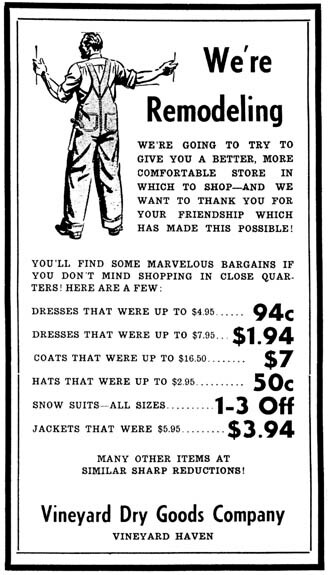 In January 1950 they called the new store next door the "Vineyard Dry Goods Annex" and sold a few stocks from Brickman's and the dry goods store there. Then, in February 1950, excavation began under the store next door, creating an enormous hole. The Gazette reported on the work underway on changes to the Vineyard Dry Goods Co. store on Main Street "to which the former Swift block, lately leased, will be added." The paper explained that the two stores were to be connected across a narrow passage between the two buildings, and the Swift building to be "greatly enlarged." The floor was lowered on the Swift building to match the Dry Goods floor, and steps eliminated on Swift's store. Finally, the front of the two buildings were joined to form one unbroken wall of "red colonial brick" to the second story. The work was done by contractor Leo DeSorcy. 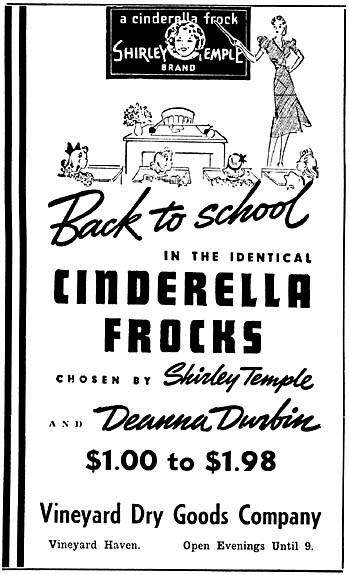 In June 1950 the double store reopened. "I remember when they put these windows in. A firm came down from off-island and the frames were there and set the window in the frame, and pushed over this side. A men went up the step ladder, and by eye took a glass cutter and walked down the step ladder and cut it just right and it popped right in. He did it by eye! It was quite a renovation job. They took this building over here and put them together. It was quite a job." "They sold mostly women's clothing and household linens and things like that. "Well the dry goods, my goodness. There was Dorothy Paltz. And there was Josephine Correllus. These people are all gone, now. I know who worked there when I did. There was Ilene Avery. I worked at the dry goods from '83 to '87. Not very long." Dave Levine died in 1976 at the age of seventy. Their son Larry Levine helped manage the store with his mother. In 1995 Ida Levine retired at the age of 86, and the business was closed after 65 years in business.